Wow, we REALLY didn’t know what the Internet was. This video of Katie Couric and Bryant Gumbel discussing the internet in 1994 could probably best be described as astonishing. I mean, I know it was all new and changing very quickly, but really, Bryant? You don’t know what the @ symbol is? Did the internet invent the @ symbol? I find it jarring to hear them talk so ignorantly about the internet. Jarring! Can you believe we all used to be like that? Also, can you believe how insufferable Bryant Gumbel seems? I bet Katie Couric hates him. Update: And the guy who uploaded this originally has been fired. This man should be celebrated, not punished! Also, I don’t know if he works for NBC or not, but if he does, and they’re the ones who fired him, they’re idiots. It’s much easier to capitalize on something like this than it is to run from it, not that there is even anything to run from here. They should have thanked him. Plus, the only people who really look even slightly bad in this are Couric and Gumbel, and they both work for different networks now. Another Update: Yup, it was NBC. Sigh. OK, OK, Dexter is a BIT formulaic. Granted, I pretty much know what to expect from a season of Dexter at this point, but it’s generally fun enough to keep me watching. When you see all of its repetitive plot devices and character tics recreated in one eighty second spoof, though, it does make the show look a tad ridiculous. Great job, LandlineTV, whoever you are! This is my favorite Dexter parody since Showtime aired that full, 12 episode fake season 3 back in 2008. Wait, that was real? The whole thing, even the Jimmy Smits stuff? No way! I know I just posted an entry about commercials, but I just saw another one that featured some shocking news that I had to share immediately. No, not the fact that she looks like Robyn. Up there in the top left corner! 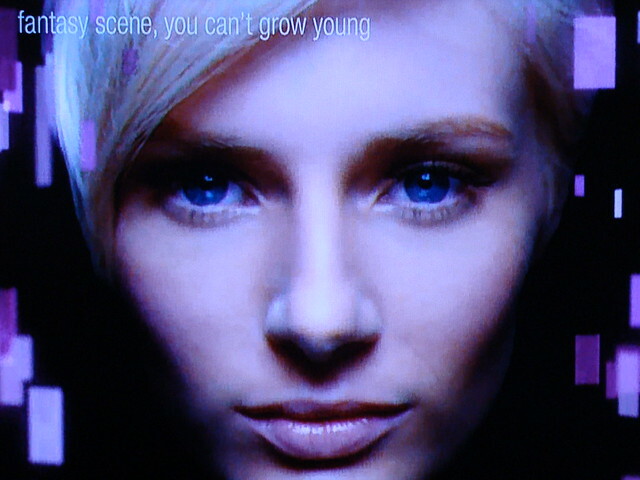 FANTASY SCENE, YOU CAN’T GROW YOUNG! What?!? And this is how you tell us, scientists? Hidden in some random commercial? What about Ben Button? That was what that movie was about, right? No one I know saw it. It’s odd how often I end up writing about commercials, because A) No one watches commercials anymore, and B) Just in general, WHO CARES? but I can’t help but find them fascinating. I think what intrigues me about the medium of television advertising is that often the true effectiveness of a commercial has absolutely no connection to how good it is, or at least how much I personally like it. Sometimes it seems like an inverse relationship. It’s the reason I title these posts “Irritating Commercials” and not “Terrible Commercials.” If I hate a commercial it usually just means that it was directed towards a different demographic. Of course, knowing all that won’t stop me from complaining about them. Nope. No, this should definitely not exist. Don’t get me wrong, I understand that there are people out there who think this is funny. Probably a lot of them. But we should not be encouraging said people. 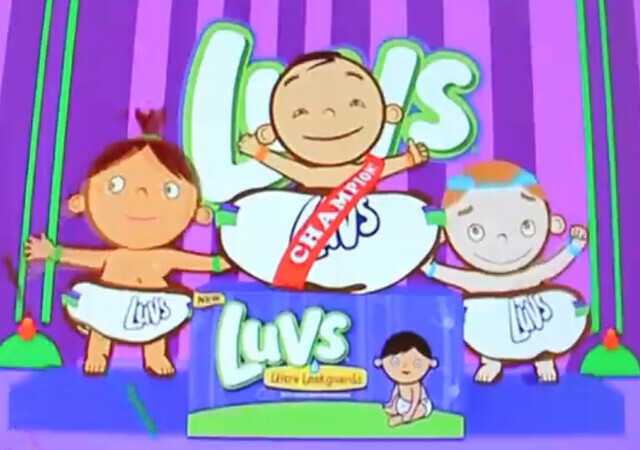 I mean, seriously, what we have here appears to be a depiction of three babies gleefully and explosively defecating into their diapers. In some sort of sick contest. Set to Tag Team’s classic and terrible 1993 novelty rap hit “Whoomp! (There It Is)“. All depicted in a style of animation that brings to mind, for me at least, 1990s breakfast cereal commercials. Nope. I don’t have a kid, so I am definitely not in the target demographic for this ad. But is this what appeals to you after you have a baby and get totally sleep-deprived and spend all your time watching bright, loud, children’s programming? I can’t believe that. I won’t. I’m sticking with my original thesis that this should not exist. Were you to walk into the living room of my apartment, it’s likely that one of the first things to draw your eye would be the massive, seven-foot-tall DVD shelf. I’ve always been vaguely uncomfortable with it. Having that many DVDs on display and out in the open like that has always seemed a bit tacky. Besides, as we all get more comfortable with digital media and hard copies of things become sort of unnecessary, having as large of a DVD library as my wife and I do is almost embarrassing. Were you to actually approach the shelf, however, things would really start to get embarrassing for me. Impulse purchases and rash decisions abound. There is nearly as much chaff as there is wheat. Both my wife Johanna and I own movies that not only are we not likely to watch again, we didn’t even really like them the first time. Below is a list of sixteen that struck me as particularly ridiculous. These aren’t necessarily the worst movies we own; a couple of these are actually pretty good. 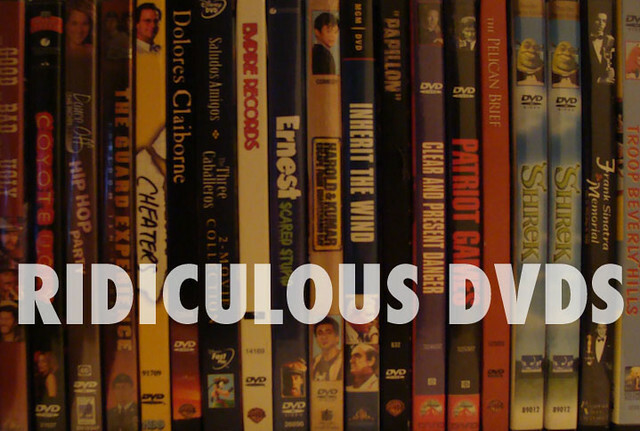 But, for one reason or another, none of these films deserves a place in our DVD collection. Most of them don’t belong in the DVD library of anyone who wasn’t directly involved in their production. I almost cut this out of the list so that I would have an even fifteen. I mean, even without having seen this I know that it’s a terrible movie. But if being terrible were the only consideration, this would be a much longer list; inclusion here requires a DVD to be particularly useless. Johanna expressed surprise, however, when I went to put it back on the shelf, saying that this was the movie she was most embarrassed to own. That was enough to re-earn it a spot. OK, so these aren’t terrible movies. 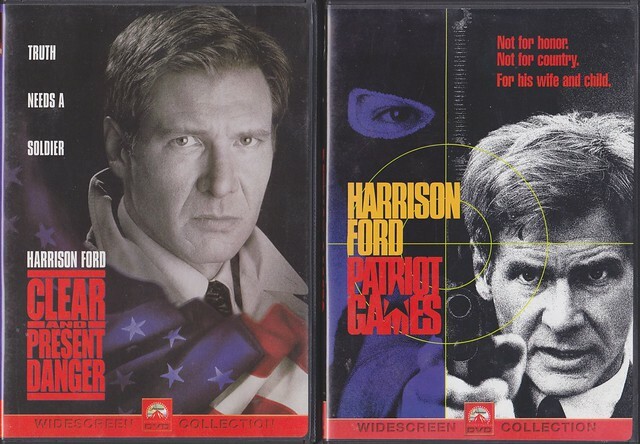 I mean, as far as action movies go, they’re a little bit quaint by today’s standards, but that’s still Harrison Ford and not Steven Seagal on the cover there. But the question remains, what would possibly compel me to buy one of these on DVD, let alone BOTH? And I can guarantee that these were separate purchases and not some discount two-pack. I decided, on two individual occasions, that I needed to purchase a Jack Ryan movie on DVD. And, both times, Harrison Ford’s Jack Ryan. Not Alec Baldwin’s Jack Ryan. Not Ben Affleck’s Jack Ryan. What was my motivation? I’ve never even read a Tom Clancy novel! The first half of this movie is actually kind of great! The second half just keeps going and going and going and is a mess. But quality isn’t really the issue here. Why do we own this? I’m kind of surprised this is even available on DVD. How many of you have even heard of this movie? Actually, the more I think about it, the more I’m glad we have this. How many copies of this can their even be in circulation? I’m guessing no more than 500. 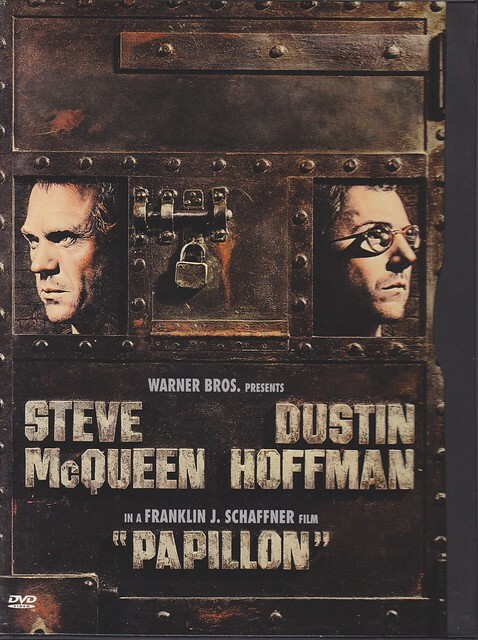 I now consider myself a part of a very exclusive Papillon club. We warmed up earlier this month with the People’s Choice Awards, but now Awards Season begins in earnest with the Golden Globes. By the way, People’s Choice Awards, you may need to reassess your existence if you’re nothing more than an unnoticed ramp-up to the ridiculous disaster that is the Golden Globes. And I’m sure you noticed that I didn’t even bother with you, Critics’ Choice Awards. As per the usual, my wife Johanna and I will be competing in a winner-picking competition. We’ve done this for nine award shows and I’ve beaten her eight times. Her one win? 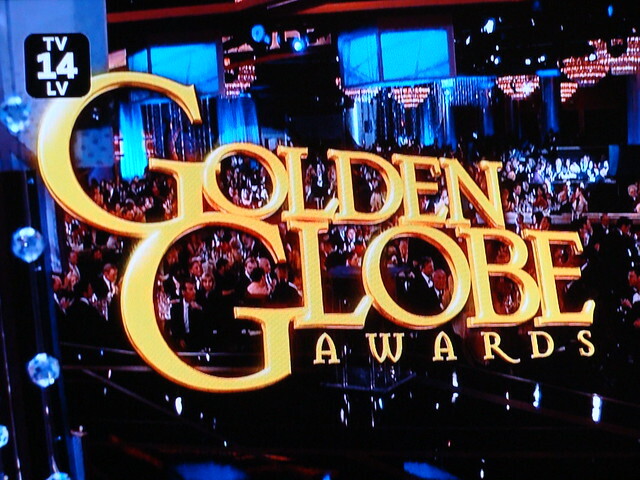 Last year’s Golden Globes. That doesn’t bode well for me tonight; I suspect her tendency to make at least one or two crazy choices really helps her because of the general goofiness of the Hollywood Foreign Press. She wants the win, too. You guys should have seen her agonizing over her ballot! I thought she was going to have a breakdown making her picks. She also had to fulfill her role as award show bartender. 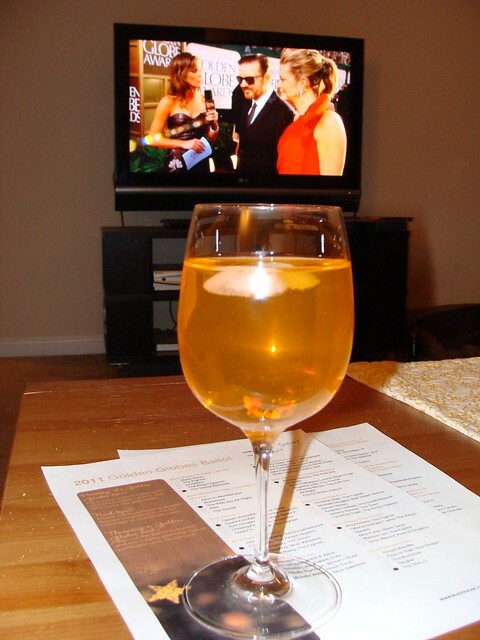 In honor of the foreign voters and the drunken, vaguely trashy vibe of the evening, she’s whipped us up a wine spritzer with equal parts Chardonnay, Sprite Zero, and Diet Orange Fanta. As she set it down in front of me she said, “These are relatively disgusting, BTW,” but I’m enjoying mine so far. She’s calling it the “Slutty Exchange Student” and assures me that she’s working on a second concoction for later this evening. All right, let’s get started. As always, categories and winners in bold. 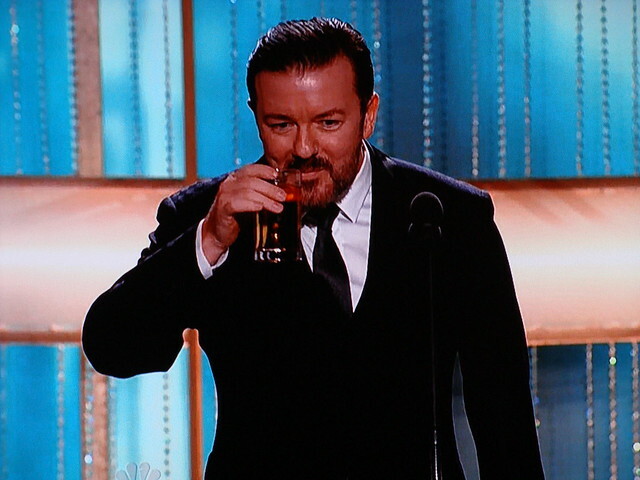 Take it away, Ricky Gervais! 8:01 – Here’s Ricky! As I said last year, I think he’s perfect for this job, mostly because he doesn’t seem to care much about offending people and he doesn’t seem stiff and over-prepared. I’m looking forward to it. His drinking a beer on stage thing is starting to feel like a gimmick, though. 8:04 – The audience has definitely warmed to him since last year. He’s getting more laughs from the famous people up front. 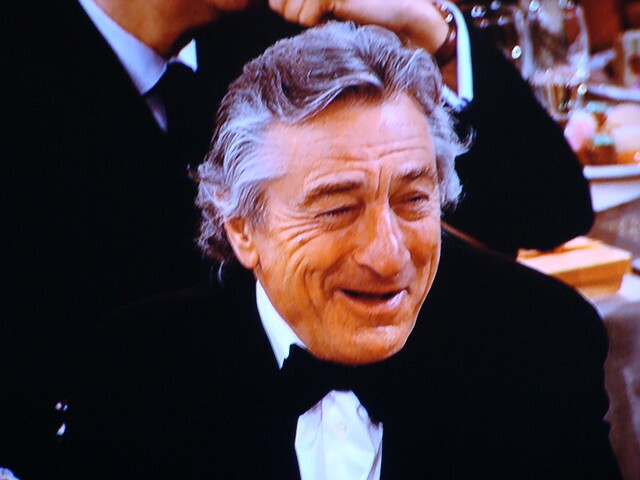 Robert De Niro is certainly enjoying himself. 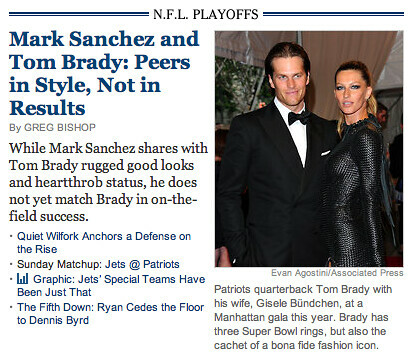 The unparalleled sports coverage of the New York Times. Because on game day what we all really want to read is an analysis of the opposing quarterbacks’ personal styles. At least the Jets vs. Patriots preview coverage features players that are currently alive. 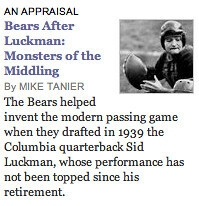 For the Chicago Bears they’re transporting us all the way back to the Great Depression. 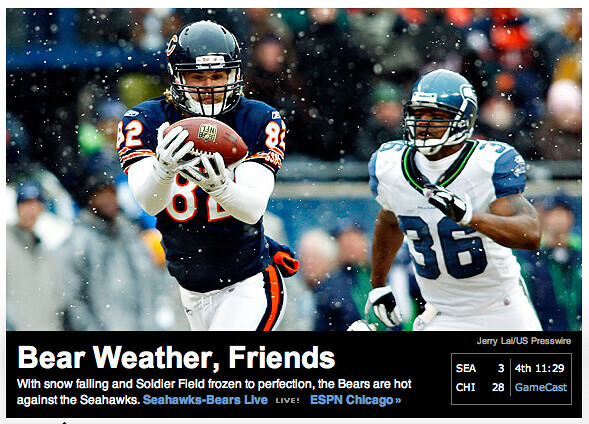 I suspect that they run stories like this because they still regret their adoption of color photography back in 1997. Someone should tell the editors that when you’re talking football you need to tap into fans’ deep-rooted anger, aggression, and bloodlust. The New York Post gets it. Columnist Steve Serby considers anything short of the literal decapitation of the opposing team’s coach and quarterback to be a failure, regardless of the score. New York Times, I love you, but you’re doing it wrong. I would like to welcome the Bulls to Boston.